DUE TO MY WEBMASTER’S COMPUTER BLOWING UP… IE NO LONGER WORKING… WE HAVE TECHNICAL ISSUES BEYOND OUR CONTROL. This event now complete… due to technical difficulties it has been broadcast on Livestream….and now will be posted on Youtube in the next 24 hours. We appreciate all advance registrations and will be splitting evenly with Farsight Institute any income from this event. Please be aware Camelot is in need of DONATIONS to continue this mission. 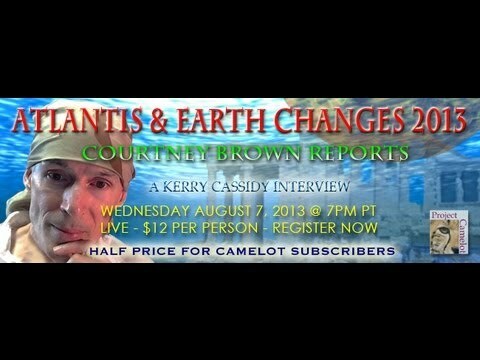 Dr. Courtney Brown will discuss two important and recently completed projects done at The Farsight Institute. The first is the successful conclusion of the 2008-2013 Climate Project, where remote viewers working at The Farsight Institute correctly described five years in advance extraordinary climate change that is still ongoing today as well as once-in-a-lifetime potentially devastating meteor events that were completely unknown to mainstream science in 2008. Dr. Brown will also give new insights and evidence suggesting how the Climate Project data may have been used by human authorities to alter our timeline. The second project is the riveting new Atlantis Project that describes in unprecedented detail the final days of a past technologically advanced human civilization on Earth that destroyed itself entirely. This is the first detailed look this ancient civilization that uses military-grade remote viewing combined with explicit Google Earth imagery to show the daily lives of the people in that society, how they witnessed their own destruction, exactly what they did exactly to destroy their world, and why we are unambiguously their descendents. Secrecy cloaked science destroyed our world in the past, and we are repeating those same mistakes today. Now is the time to learn from our past. This Camelot Roundtable discussion covers the methods and madness of those who are orchestrating various false flags, assassinations and other events aimed at causing chaos which they will then manage by putting in place the NWO. This is a process in full swing and there is a pattern to the set up and takedown of individuals and groups that is being manipulated to serve their diabolical end. This highly distinguished group of speakers will discuss the various recent incidents from a global perspective.